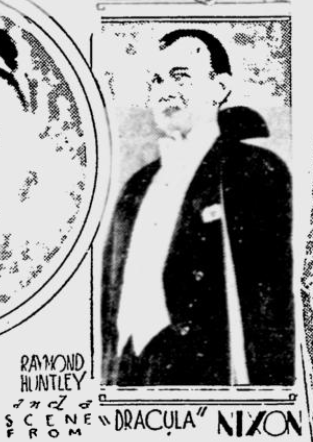 Raymond Huntley portrayed Dracula in its West End debut. 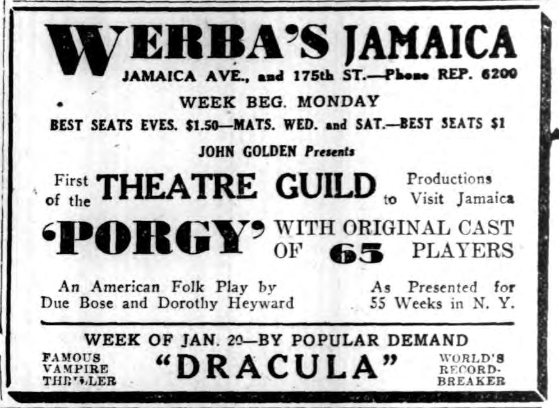 He reprised the role on the American stage. 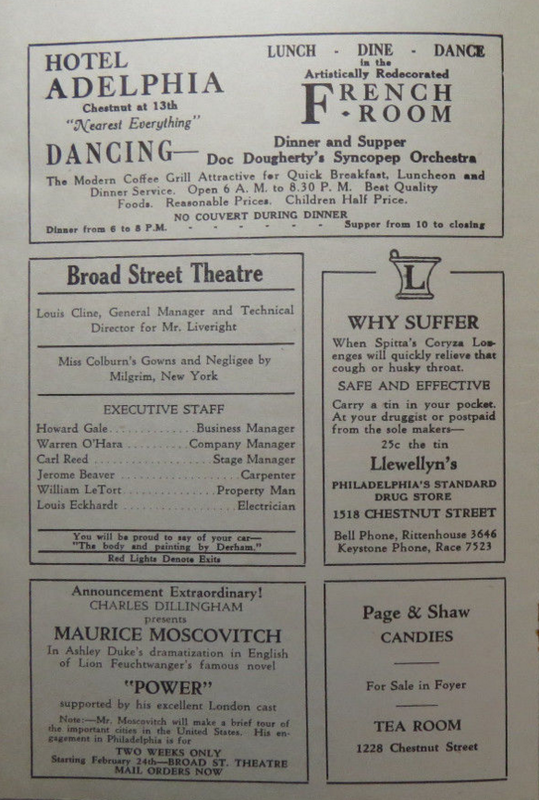 He enjoyed a long career on stage, screen and TV. His film career stretched from 1934-1974, and included Rembrandt (1937), with Charles Laughton, The Ghost Train (1941), Passport To Pimlico (1949), The Green Man (1956), The Mummy (1959), and Young Winston (1972). 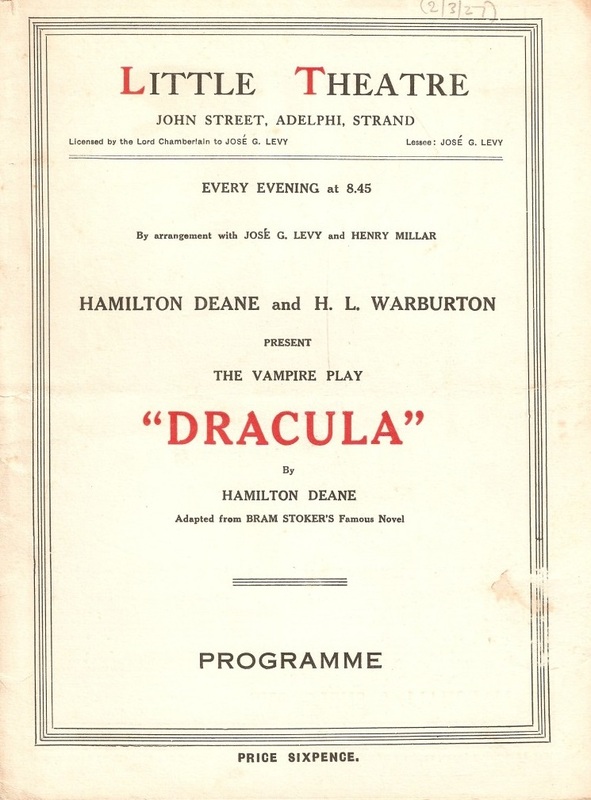 A dramatic version of Mr. Bram Stoker’s Dracula, by Mr. Hamilton Deane, is to be presented at the Little Theatre next Monday. 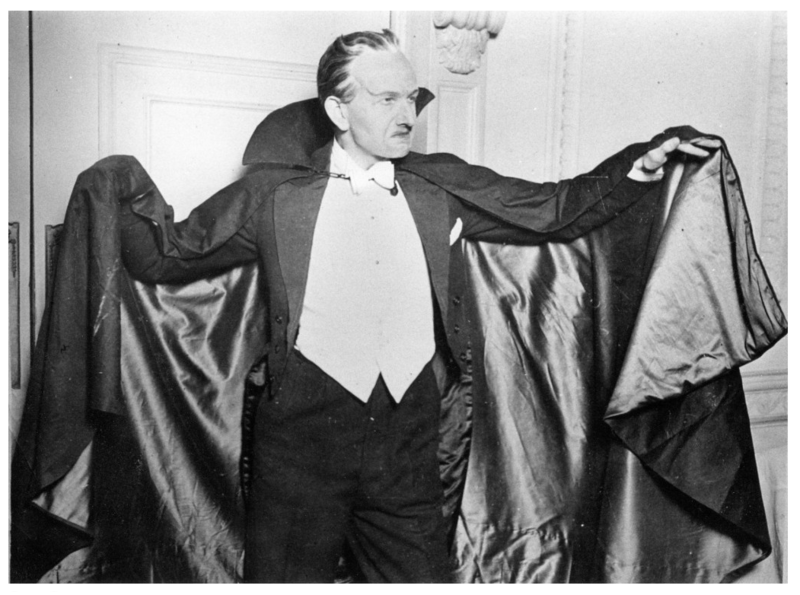 Herewith, one of the very few photographs of the late Bram Stoker, who, besides being Sir Henry Irving’s manager for years, was an industrious novelist. 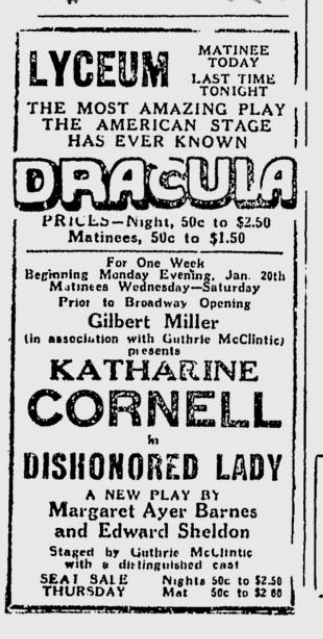 As I have already said, a dramatic version of his most famous book, ‘Dracula,’ is to be done at he Little on Monday, and the scene of the Grand Guignol plays is appropriate, for the new piece, I hear, is so full of gruesome thrills that, in the provinces women having been carried fainting from the auditorium. Truly we take our pleasure sadly. 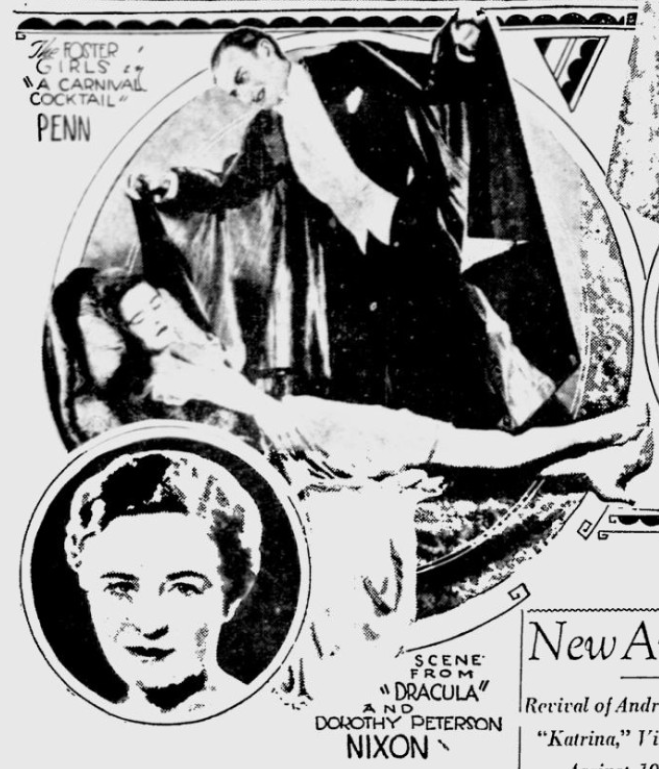 The dramatic adaptation is by Hamilton Deane, whose grandfather, Colonel Deane, and the Rev. Abraham Stoker, Bram’s father, lived on adjoining estates in County Dublin. Young Bram and Hamilton Deane’s mother, then a young girl, were great friends. 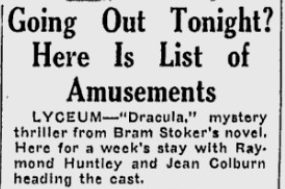 Stoker had the book ‘Dracula’ in his mind, and the young people used to discuss its possibilities. 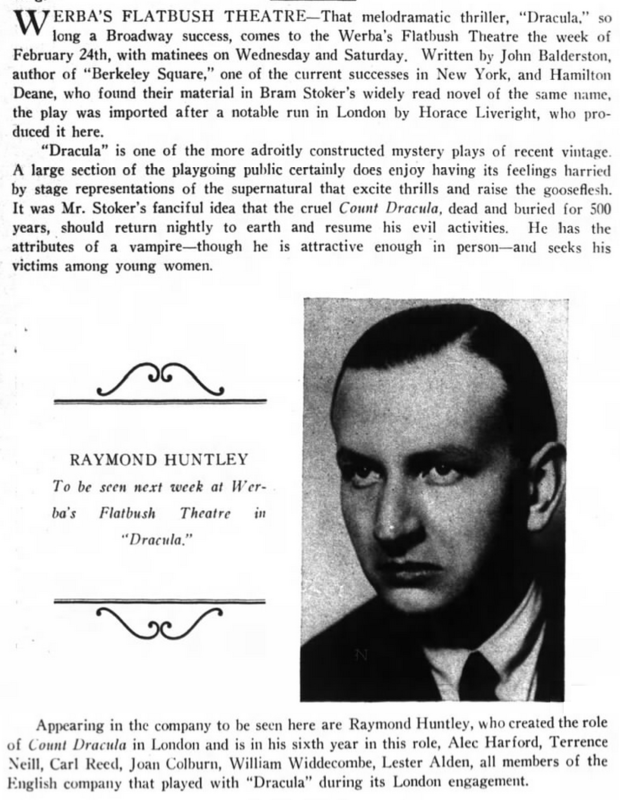 Strange that it should be young Hamilton Deane who has dramatized the book and brought the play to London. 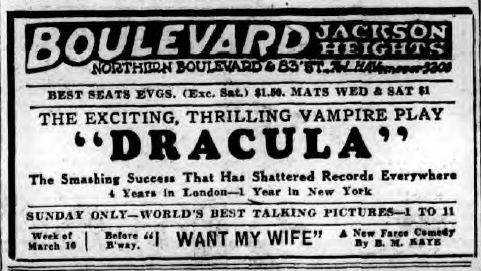 In relation to modern plays, “vampire” usually means a woman suffering from acute Hollywood fever. 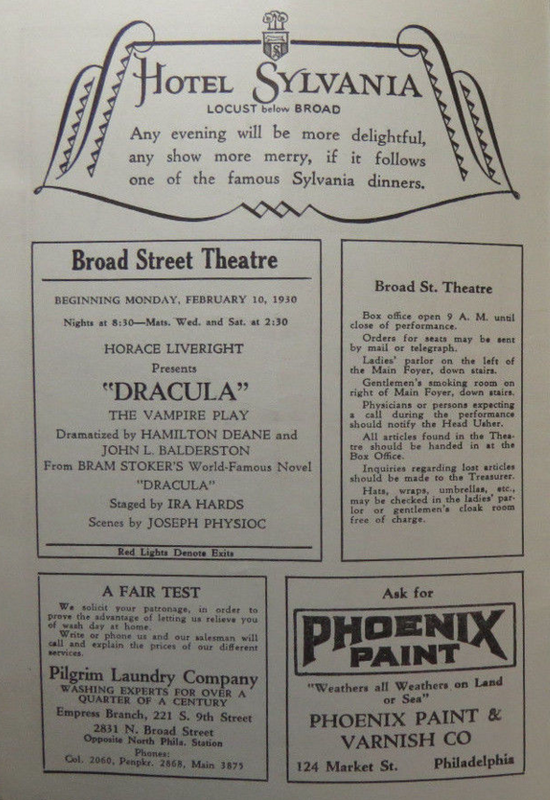 A Vampire of the earlier supernatural kind was the chief character in Bram Stoker’s sensational novel “Dracula.” A play founded on the book has been successful on tour for some time in Great Britain, and it is now being brought to London. 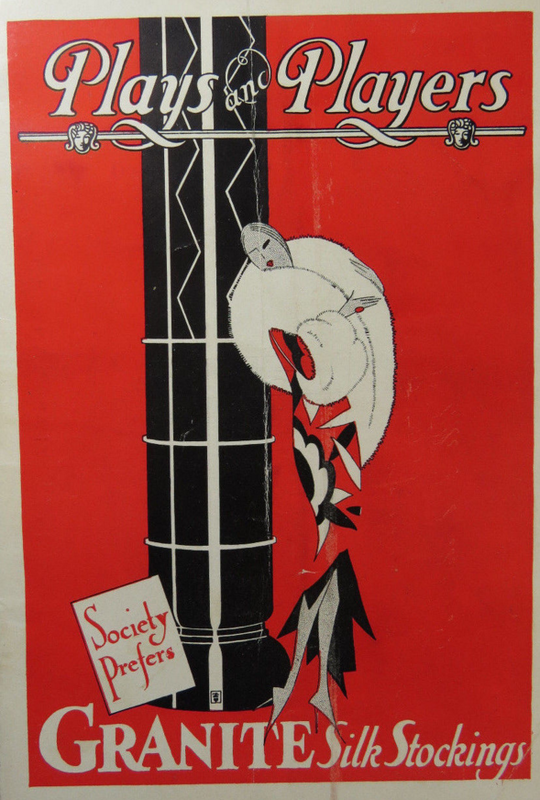 For Many years Stoker was Sir Henry Irving’s business manager. 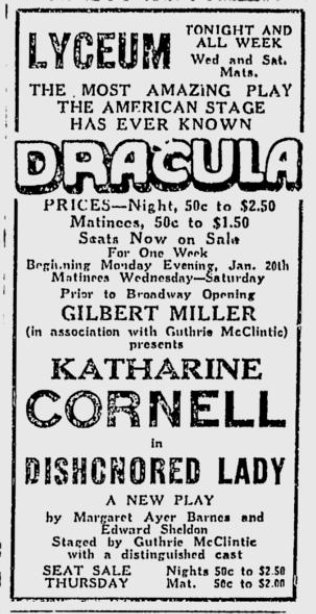 He wrote several novels, none quite as enthralling as “Dracula,” and a breezy book of memories. 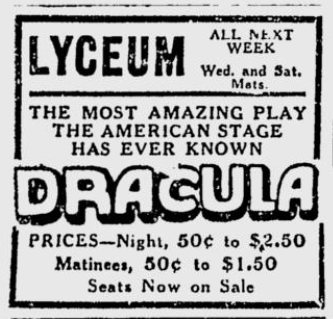 A dramatic version of Bram Stoker’s famous novel of the weird and terrifying, “Dracula,” has been produced with success in London. 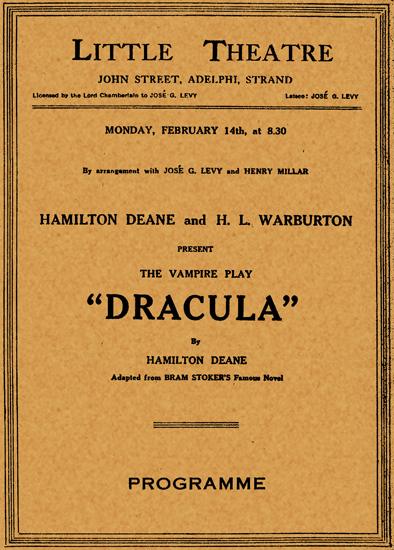 A London message states that the hysterics of a woman in the stalls at the conclusion of the first act, held up the vampire play “Dracula,” at the Little Theatre for half-an-hour. 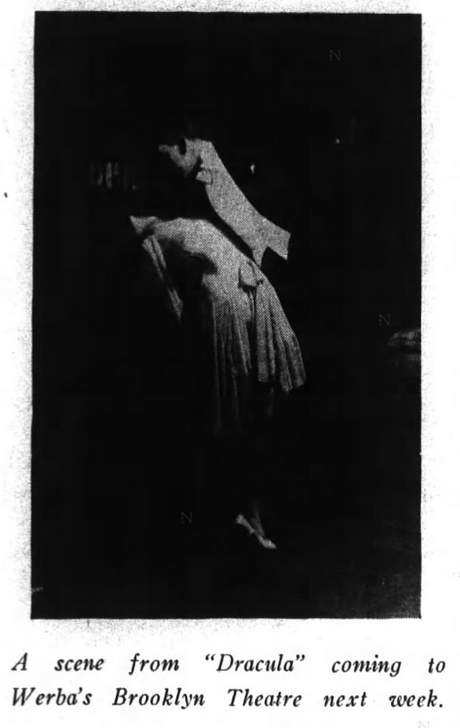 Four other women fainted. 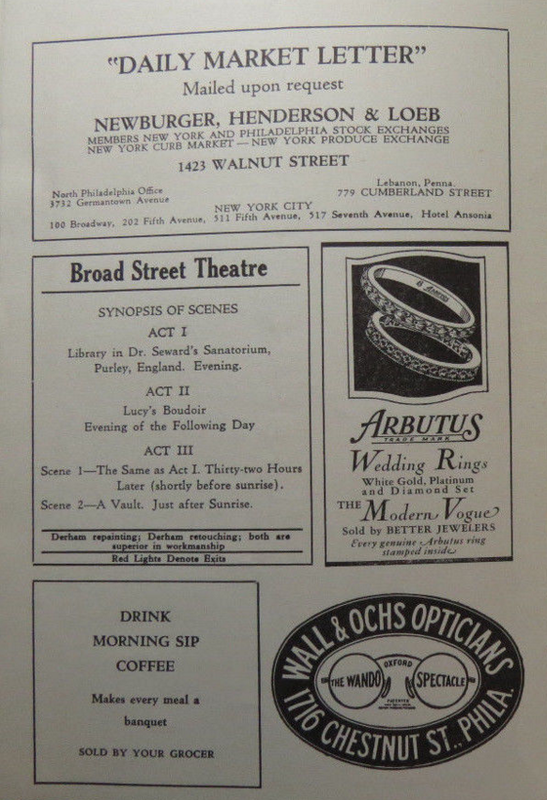 A doctor and a trained nurse attend all performances owing to the frequency of patrons’ prostration. 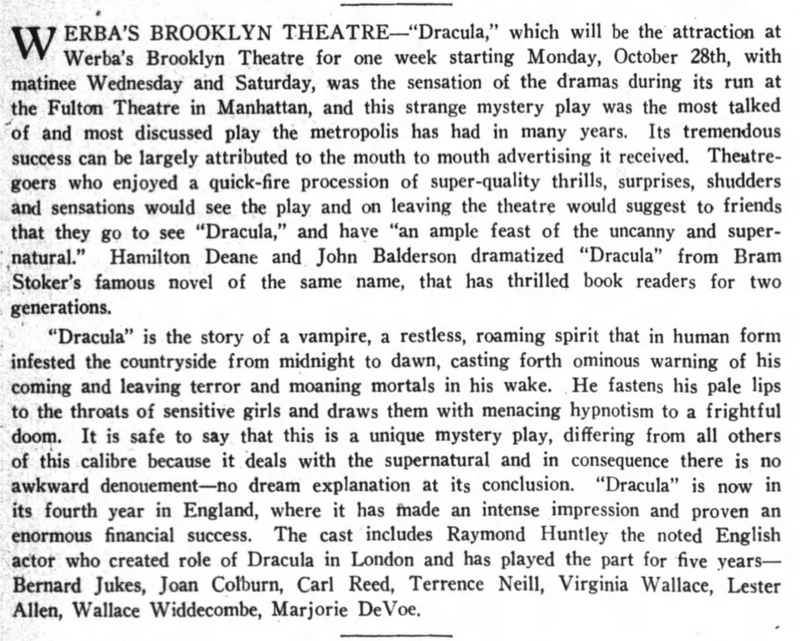 Dracula, which is still running at the Little Theatre, will be produced in New York on September 7 with Mr. Bernard Jukes in the part he is now playing in London. 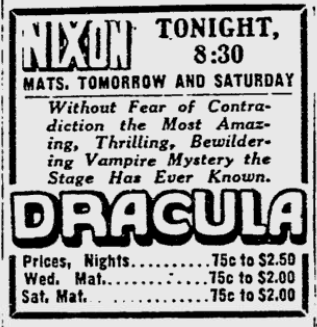 Other productions soon to be withdrawn are Dracula, which ends a very successful run at the Little on Saturday; …. 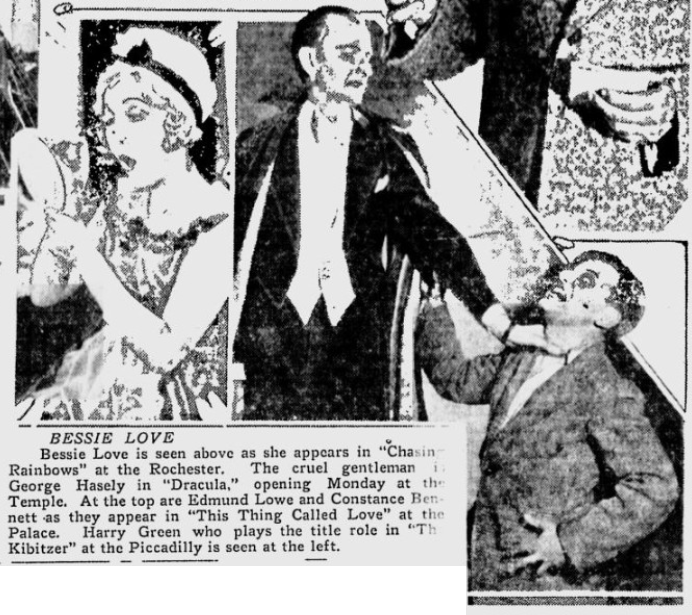 The Man Responsible, now running at the Royalty, will be transferred to the Little Theatre. 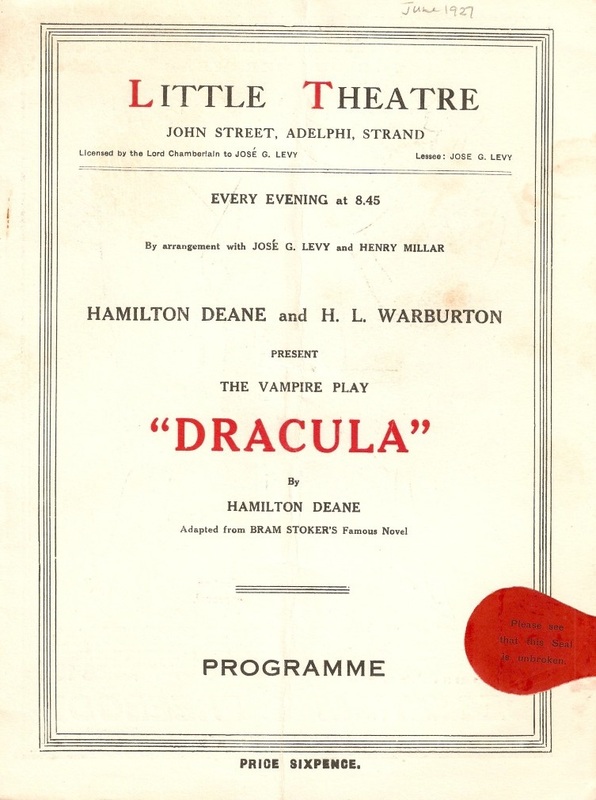 To make way for it, Dracula will leave the Little Theatre on Saturday and next Monday will be transferred to the Duke of York’s, where the farce, Newly Divorced, was withdrawn last Saturday after a run. 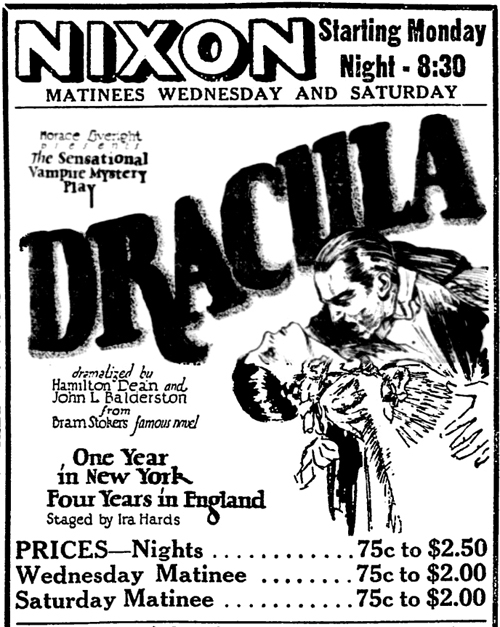 After having run at the Little Theatre for some months, Dracula, Mr. Hamiton Deane’s version of Mr. Bram Stoker’s novel, was transferred on Monday night to the Duke of York’s Theatre, where a larger audience can watch the blood-curdlings adventures if this rather old-fashioned vampire. Mr. Sam Liversey is now playing the part of van Helsing, first taken by Mr. Deane, and makes him an interesting figure. 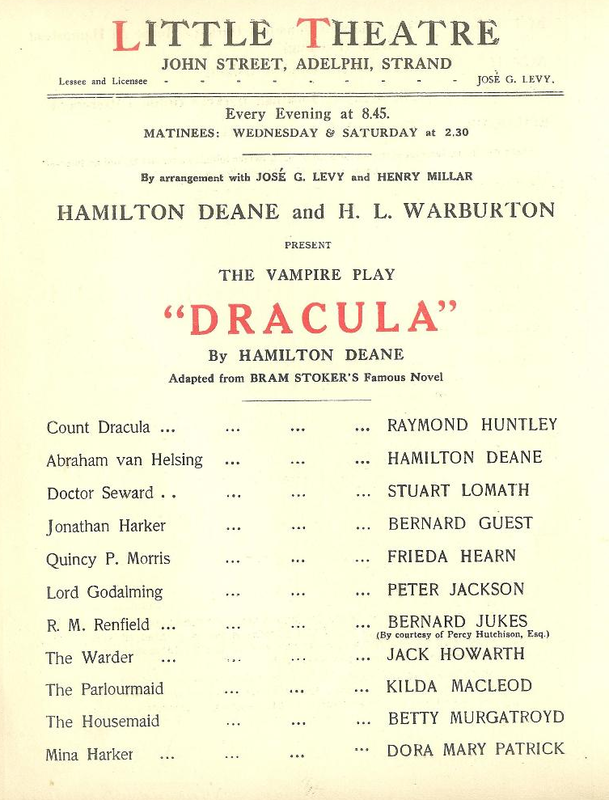 Dracula at the Duke of York’s Theatre will reach its 200th performance on Saturday. 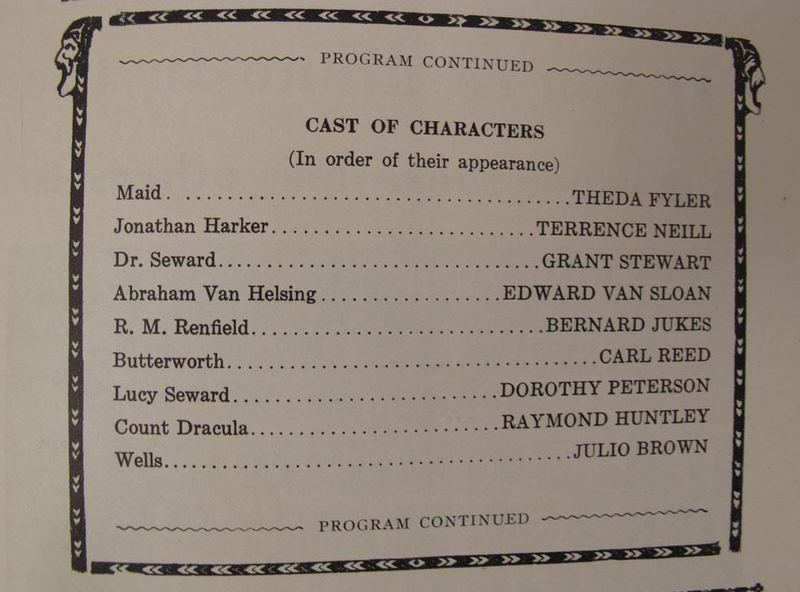 Mr. Raymond Huntley has rejoined the cast to play his original part of Count Dracula. 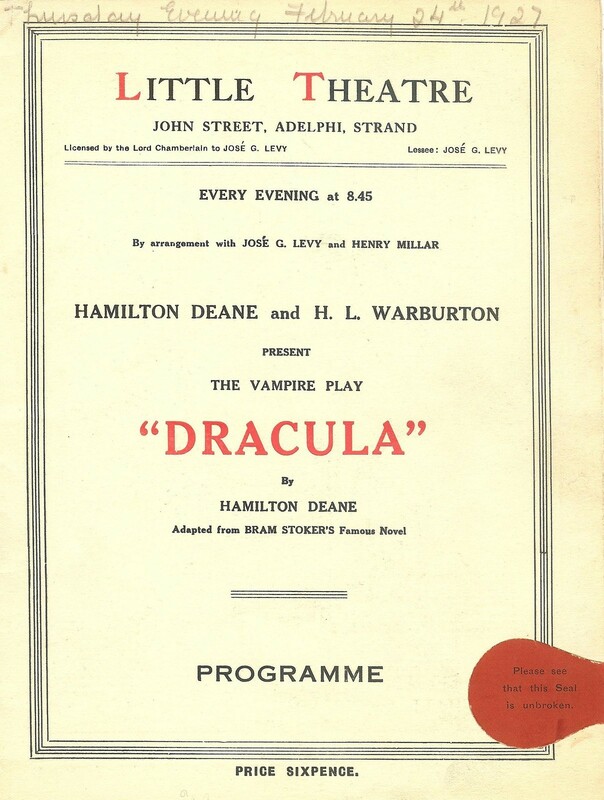 Dracula, which is at present running at the Duke of York’s Theatre, will be transferred next Monday to the Prince of Wales Theatre, where it will succeed the musical comedy The Blue Train. 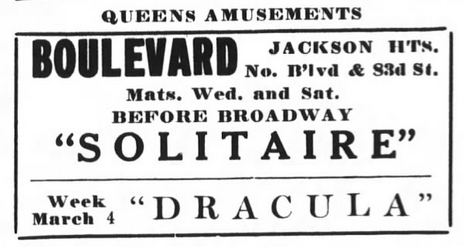 Its place at the Duke of York’s will be taken on September 1 by The Beloved Vagabond, the musical version of Mr. W.J. 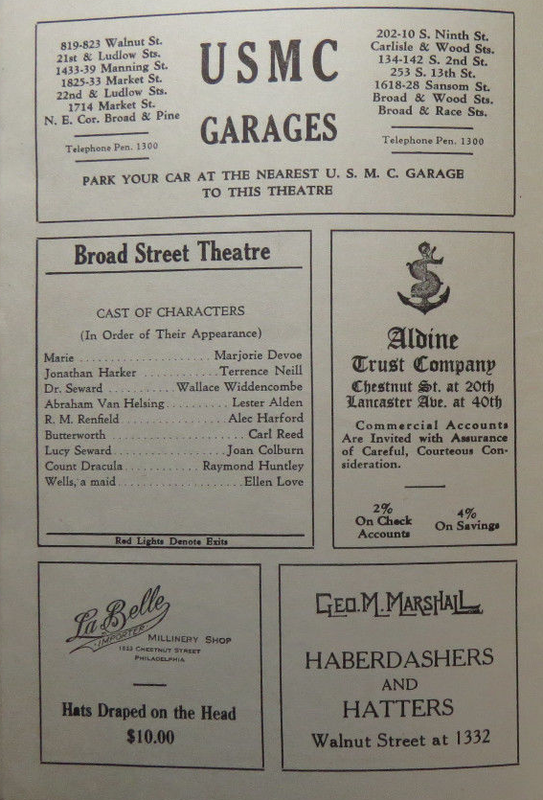 Locke’s novel, in which Miss Lillian Davies, Mr. Frederick Ranalow, and Miss Mabel Russell will appear. 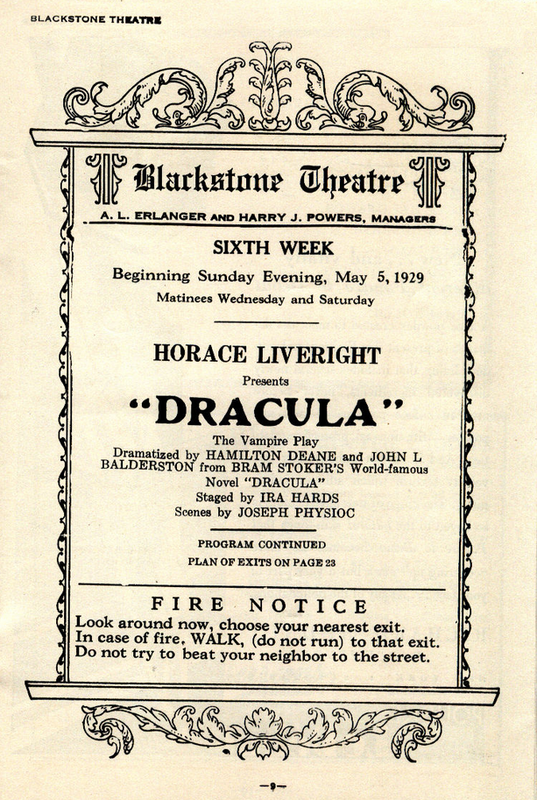 When a revised version of Dracula by John L. Balderstone was produced for the American stage, Raymond Huntley was producer Horace Liveright’s first choice for the role of Dracula. 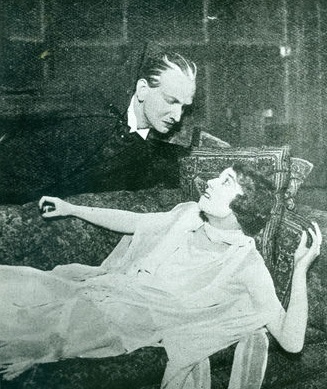 Dissatisfied with the $150 per week offered by Liveright, Huntley turned down the role, paving the way for Bela Lugosi’s casting. 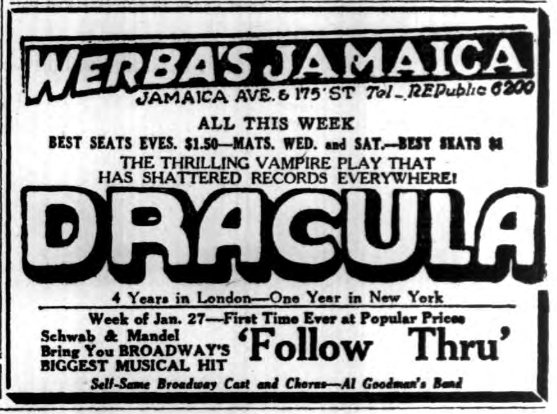 Huntley was later persuaded to appear in touring productions of Dracula covering the East Coast and the Midwest from 1928-1930. 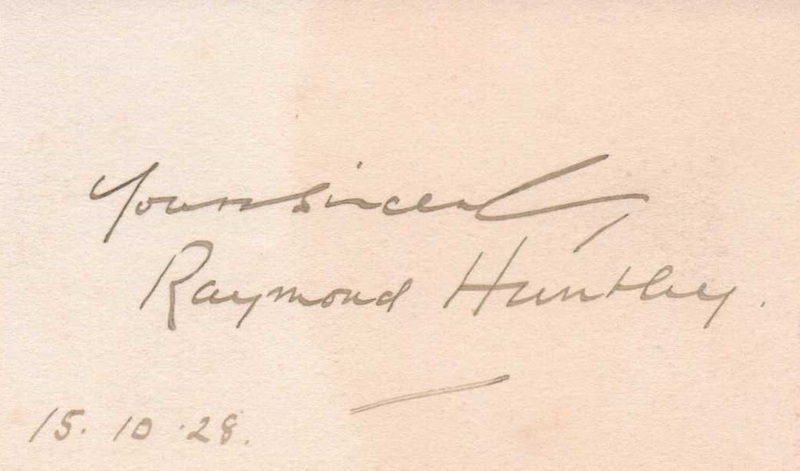 Raymond Huntley autograph signed during Dracula’s run at the Hollis Theatre.